Cancer reoccurred in 2012. 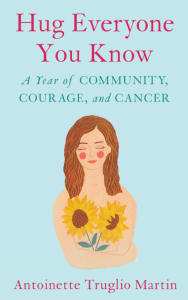 I was diagnosed with metastatic breast cancer—a forever battle. It was a scary time for my family and me. There was so much uncertainty. Everyone coped in their own way. My youngest daughter, Robyn, needed to take a walk. She took off for Spain to hike the Camino de Santiago, an ancient pilgrimage honoring St. James the Apostle’s strength of faith. Robyn walked for three weeks—sometimes alone, other times alongside fellow pilgrims with the same visceral mission. She followed through on this “thing” that seemed to call her. Robyn arrived at the Santiago de Compostela in time for Easter Sunday Mass. She returned home armed with inner strength to trust her heart in directing life choices. Robyn had hiked 200 miles. She saved a leg of the trail to the sea for me and her to walk together. Finisterre, the End of the Earth, was a 60-mile hike from the Compostela and where the remains of St. James the Apostle was discovered. At the time, I was not certain the treatment protocols would work. Taking on such a challenge—a pilgrimage to honor faith, strength, and perseverance, seemed like a reach. But we set our sights. In April 2015, everything lined up perfectly. Treatment had been holding the cancer at bay. Robyn and I had the same ten-day spring break schedule. I bought the tickets and new sneakers and packed a 25-pound backpack. It was an amazing experience on so many levels. Food adventures took on a big role. Little cafes offered rest stops and tapas to all pilgrims along the way. The small plates ranged from eggs on crostini, to bean and onion relish. The best tapas were the octopus. I am a big seafood eater. I prefer seafood over any meat, but I was not familiar with octopus. I’ve seen octopus at the fish store counters, but I never ventured to prepared it. Mom and Grandma dubbed octopus as too tough, too difficult to clean, and not as tasty as squid or conch, thereby not worth the effort. Spanish octopus put all these claims aside. It was divine. Some dishes had octopus with white beans in a sweet vinaigrette. Others were presented in a light tomato sauce. Each bite was tender, flavorful, divine. We had to have octopus every day while on the trail. We did. Robyn and I hiked through villages and woodlands to the shore until we climbed to the end point of Finisterre. Breathtaking views, my girl at my side, great food, amazing people to meet all added up to an incredible experience. No matter what the future brings, this adventure with my Robyn was a treasured gift. Discovering octopus was a bonus. I was also afraid to try octopus, but I also found I loved it. Made well, it is simply tender, succulent, and insanely delicious! Hello Antoinette! I found your blog through Jennifer Jones and so glad I did. Firstly, I’m sorry about your battle, my mother battled for ten years many years ago and I think it is wonderful that you were able to do some of the walk with your daughter. Such a lovely experience for you both. I’m not sure if you link up to link parties, but a friend and I host the Midlife Share the Love Party each Wednesday. It is a very special niche as we don’t do recipes or craft/diy but it is geared to those of us who are writing about our experiences in Midlife & Beyond. If you are keen just let me know and I can add you to reminder list. Thank you, Sue, for the invite. Please sign me up for a reminder. After April’s A-Z , I will like to join you. Thank you foor teh invite, Sue. Sign me up for a reminder. I will be reachable once the A-Z challenge is done. What an inspirational post. It was great you could do some of the walk your daughter. We eat baby octopus cooked on the barbecue. It is usually cleaned when we buy it from the fish shop. I read where marinating with some papaya will tenderise it and found that it works. I’ve never been much of a hiker but after reading s book. On hiking the Appalachian, I’d love to, but that could never happen. I give them credit! I finally ate fried octopus fir the family Xmas Eve meal – love it fried and dipped in marinara sauce!